The research in our lab is principally concerned with understanding how the central nervous system controls movement and mechanics of the arms and legs. To this end we study the mechanics and activation patterns of muscles during various activities. In thinking about muscles, the focus is frequently on their force generating capacity. The importance of their viscoelastic properties is not often recognized. In fact, the stiffness conferred by muscles is vital for the maintenance of stable limb posture. Furthermore, stiffness is adaptable. We have recently shown that the central nervous system is quite adept at controlling the stiffness of the arm, independently of the force. One focus of our research is on the mechanisms involved in motor learning. We are attempting to determine the neural mechanisms that are responsible for improvement in performance with practice. We are interested both in how the central nervous system learns to generate appropriate forces to counteract mechanical disturbances encountered in the environment and how it modulates stiffness during learning. We are also conducting functional brain imaging studies in collaboration with researchers at the Advanced Telecommunications Research Institute (ATR) near Nara, Japan. We are investigating the roles of different brain areas in motor control and motor learning. We currently have an exchange program which allows students from our laboratory to visit ATR for up to 3 months to collect data for their thesis research. We are interested in potential applications of this research to assessment and rehabilitation in neurological disorders such as stroke. Once we understand the mechanism by which sensory information is used to improve performance in neurologically normal individuals we may be able to use this knowledge to improve rehabilitation. For example, it may be possible to manipulate sensory signals to induce changes in muscle activation patterns in conditions where motor control is impaired, which might otherwise never occur. We are currently conducting a study to assess the effectiveness of robot-assisted rehabilitation of hand function after stroke. A second focus is on how the central nervous system adapts the mechanical impedance (inertia, damping and stiffness) of the arms or legs, according to the requirements of the task. We are particularly interested in whether the neuromuscular impedance and the environmental impedance can be optimized to enhance performance in different activities. Our approach draws largely from the fields of physiology and engineering. We model the limbs as mechanical structures whose mechanical behavior is dependent upon patterns of muscle activation that represent the combined action of descending commands and sensory feedback to muscles. 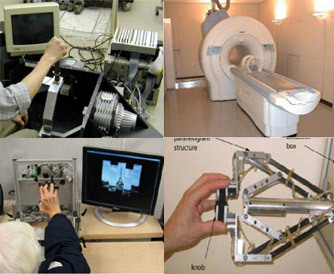 The control problems associated with use of human limbs are similar to problems encountered in robotics, namely controlling kinematics (the position, orientation and trajectory of an end effector), dynamics (applying forces and torques to the environment) and mechanical impedance (responding to forces and torques applied by the environment). We have developed tools and techniques to investigate the mechanical behavior of single articulations (elbow, wrist and individual finger joints) and multi-articulated structures (finger, arm, leg) during posture and voluntary movement. The laboratory is well equipped with instrumentation for mechanical measurements (position, velocity, acceleration, force, torque), computers, data acquisition hardware and software and data analysis software. We manufacture miniature EMG electrodes with on-board amplification and filtering. We have a single-axis computer-controlled manipulandum for studying control of wrist and finger movement, a two degree-of-freedom computer-controlled manipulandum (joystick) for studying arm movement and a stationary bicycle coupled to a powerful computer-controlled torque motor (1000 W) to study control of leg movement.